United Colours of War examines the aftermath of 9/11 by looking at the increase in the business of war. 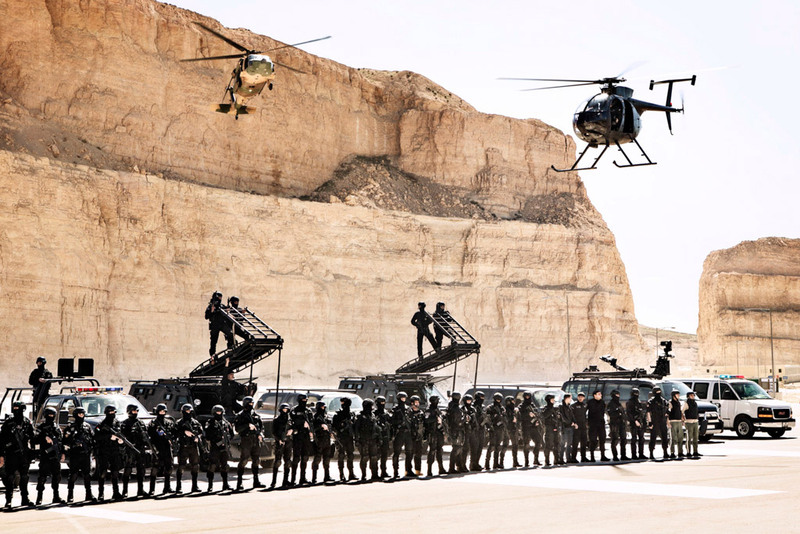 During the opening ceremony of Warrior Competion on March 22, 2013 the Royal Jordanian Special Forces did an exhibition where they demonstrated many assault techniques. 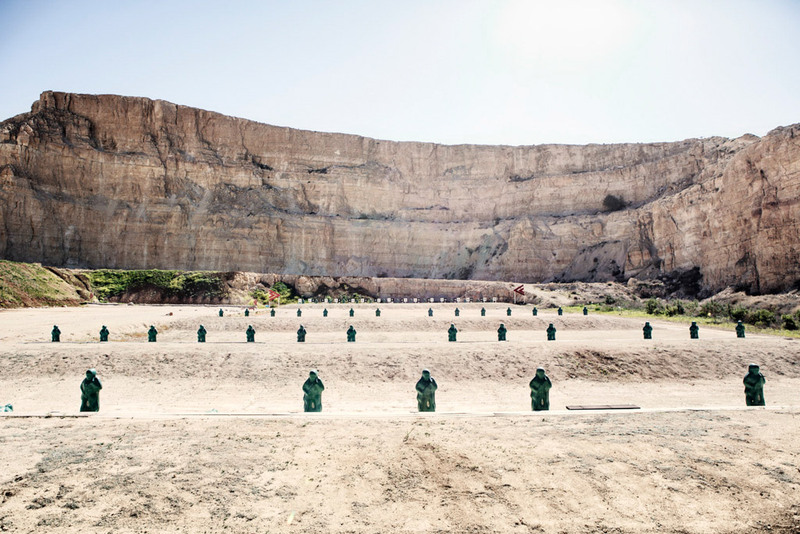 The 300 square meters is a complex range where you can hit targets at different distances. The targets are controlled by the control center. 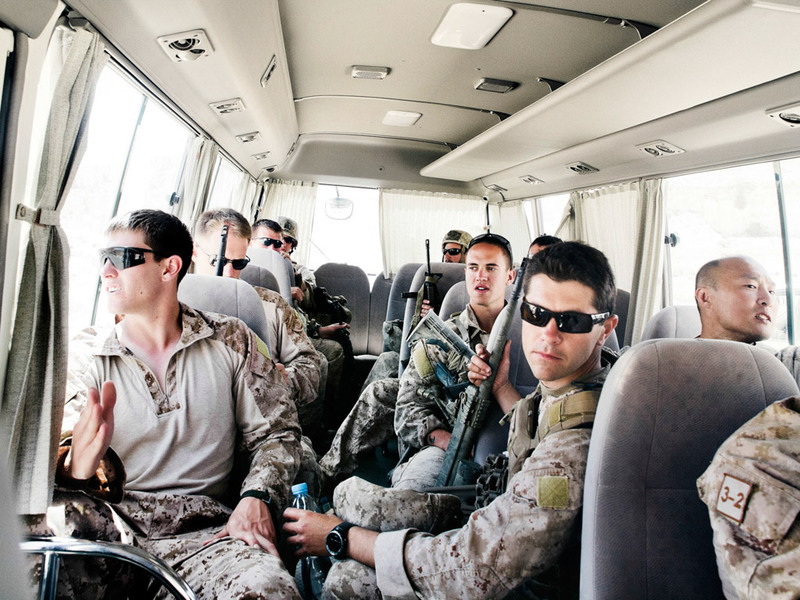 US Marines inside a bus are reaching arrive at one of the locations where they have to compete. 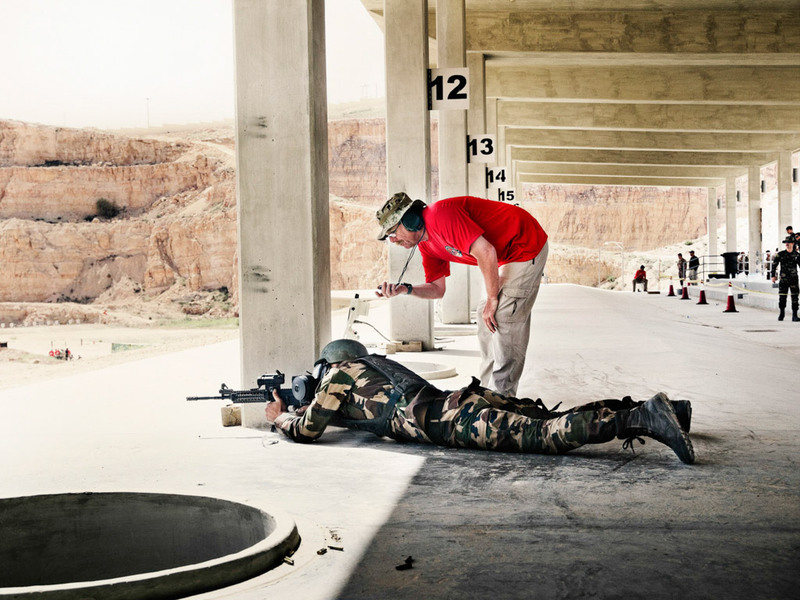 Chinese Snow Leopard team train before enter in the King's Challenge event, a 10 Km biathlon style team relay to test planning, endurance, speed, pistol markmanship, physical fitness, patience and team work. 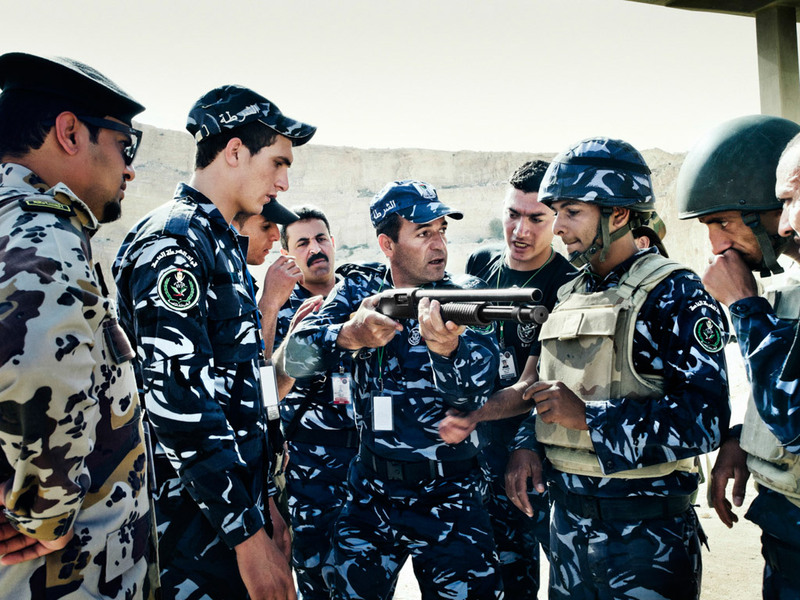 The team leader of the Palestine Territories Warirors shows to his soldiers how to act during one of the event of the competition 2012. During the competition, the officials lined up the team before and time them on the start and on the arrival. At the end of the day will be prepared a temporary rank and presented to the team leader at the auditorium. The Special Operations Regiment team running during the King's Challenge Event a 10 Km biathlon style team relay to test planning, endurance, speed, pistol markmanship, physical fitness, patience and team work. Hostage Rescue in the Urban Area of KASOTC. This is the largest mock city in existence, sixty-seven buildings, clustered together to resemble everything from an Afghan village to an embassy. The Urban Area of Kasotc used to imitate the battleground inside a city. 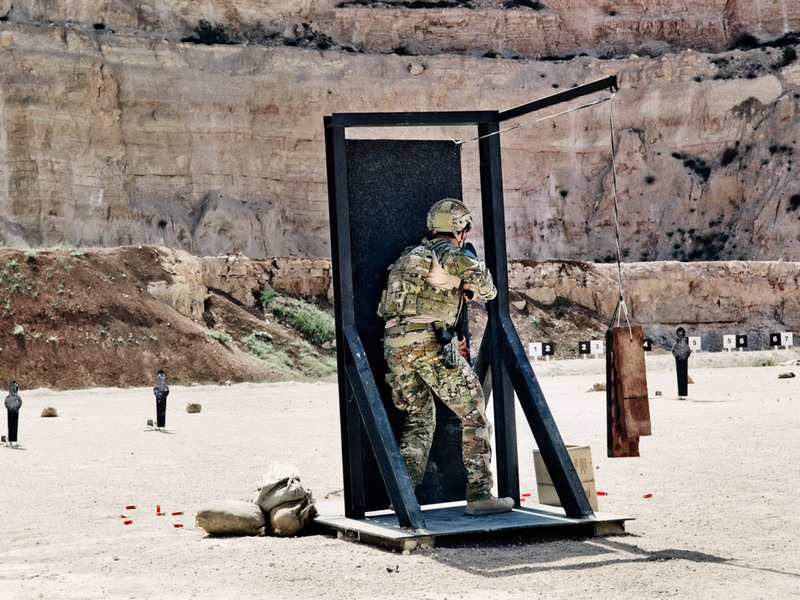 US Marines breaks a fake door where he has to shoot some targets. 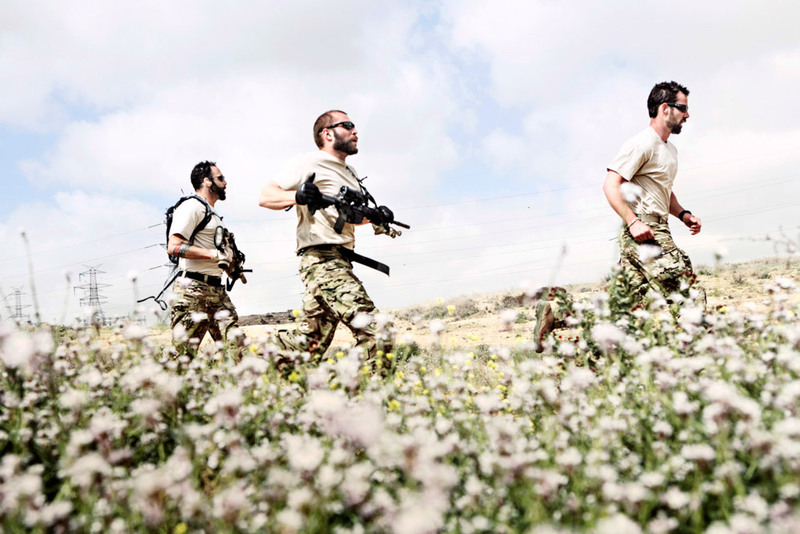 Some warriors of the Palestine National Security Force support their teammates during the day 1 event precision 300 meters range. 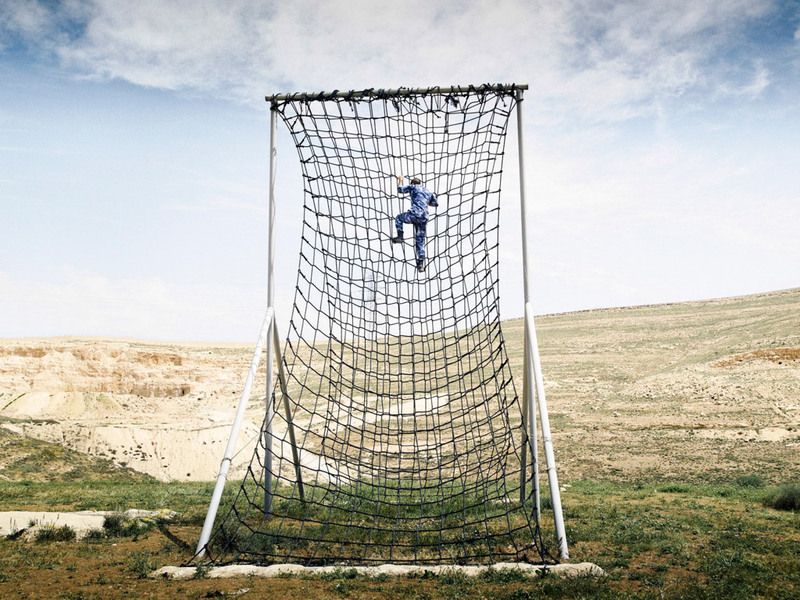 A Warrior from Palestine climbs a fifteen-meter-high net during an event in the 2012 competition. A Warrior from Palestine gives a shhh to one of his teammate after a good performance during the 2012 warrior competition. 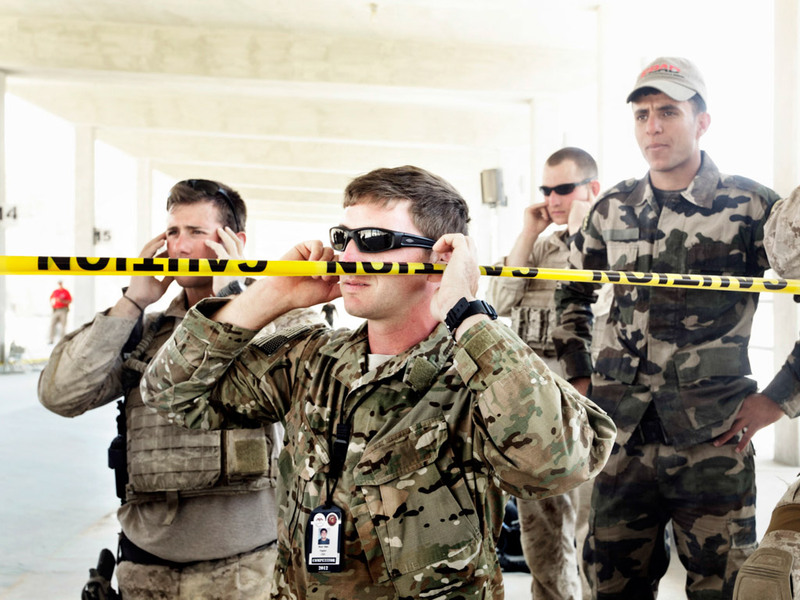 US Marines protects their ears during a during a 800 meters snipers test, while a warrior from Palestine doesn't do that. He told he gets use with this noise at home. 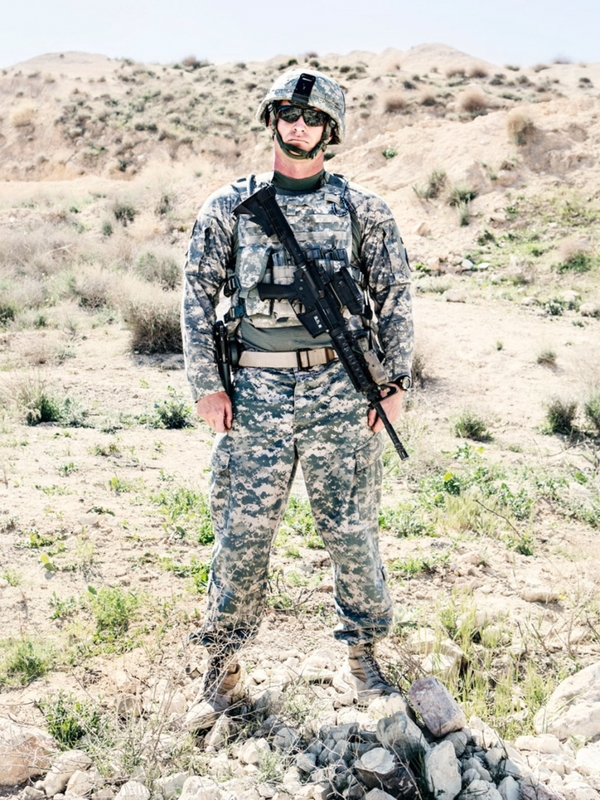 A Palestine Warrior timed by a retired US Marines, during a 300 to 800 meters snipers test. 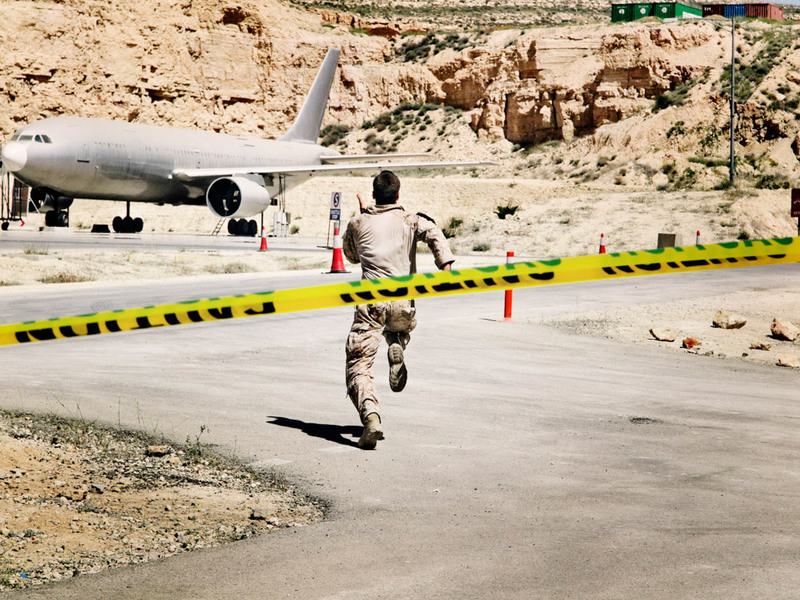 US Marine running to the Airbus 300 during an event of the 2012 Warrior Competition. The Airfcraft Assault event. 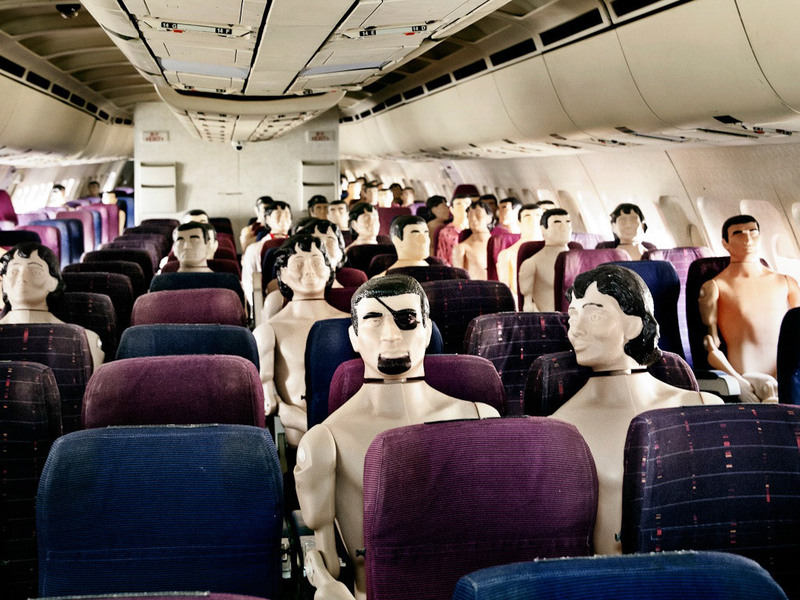 Teams have to assault the aircraft, then shoot a series of targets, take a big heavy bag and flee as fast as possible. Inside the full-scale Airbus 300 aircraft model there are also initiating targets to stand up from their seats, introduction of smells/sounds of the battlefield and video/audio capture of all training inside and out. 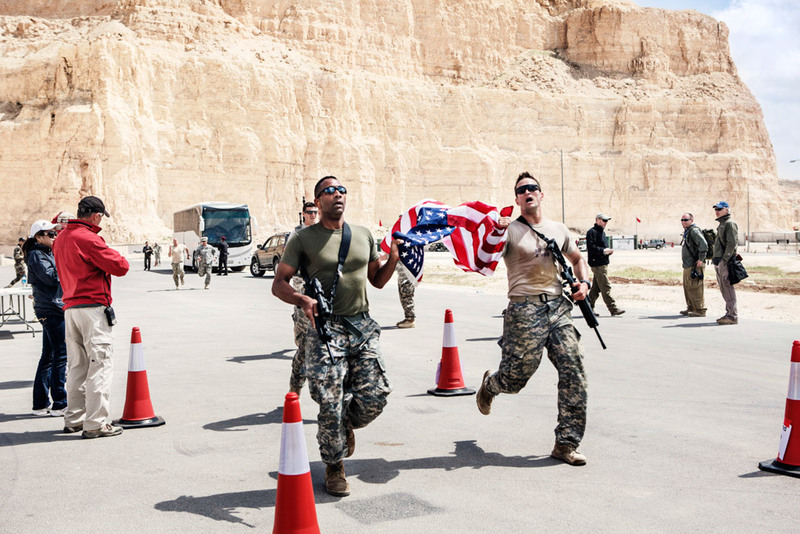 One of the two ARCENT team from US arriving at the end of the King's Challenge Event showing the US Flag. They run and shoot on a 10 Km biathlon style, this event is one of the toughest of the competition. 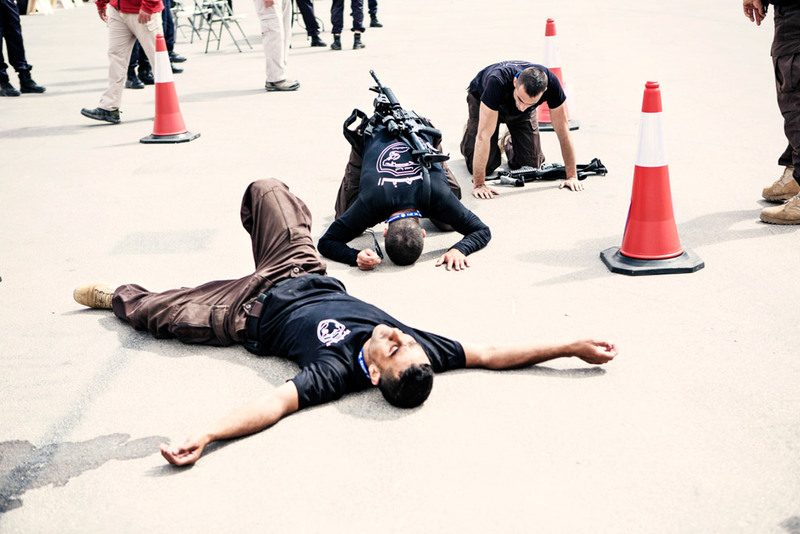 Lebanese Panthers exhausted after the King's Challenge Event where the warriors have been running and shooting on a 10 Km biathlon style. 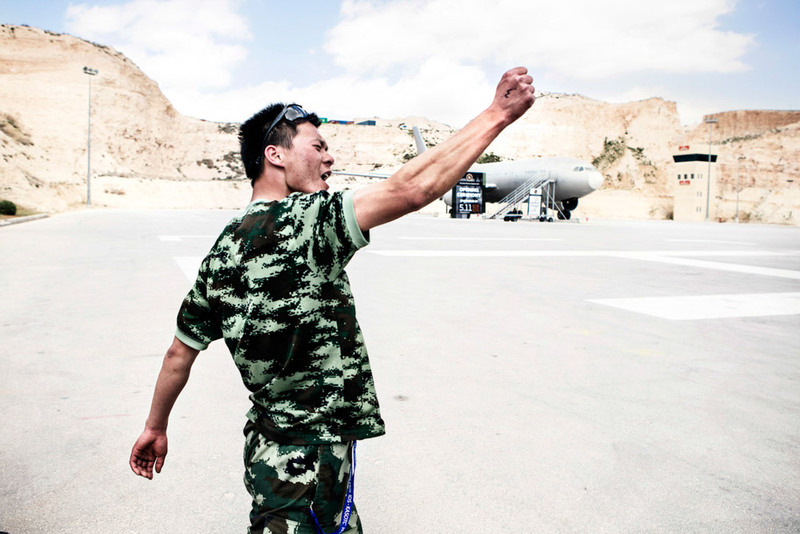 A Warrior of the Special Operations Unit of the Chinese People's Armed Force exults after finished the King's Challenge Event where he runs and shoots on a 10 Km biathlon style. The Event is one of the toughest of the competition. 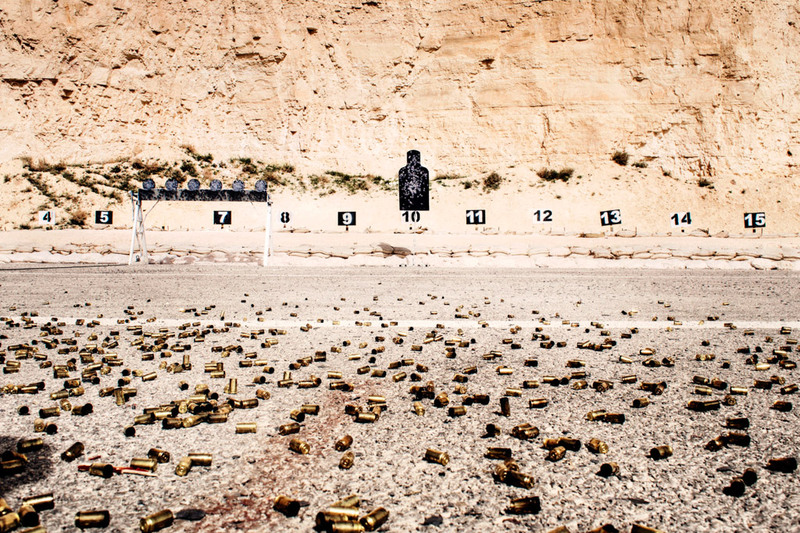 Hundreds of empty bullets on the ground after a event of the competition. 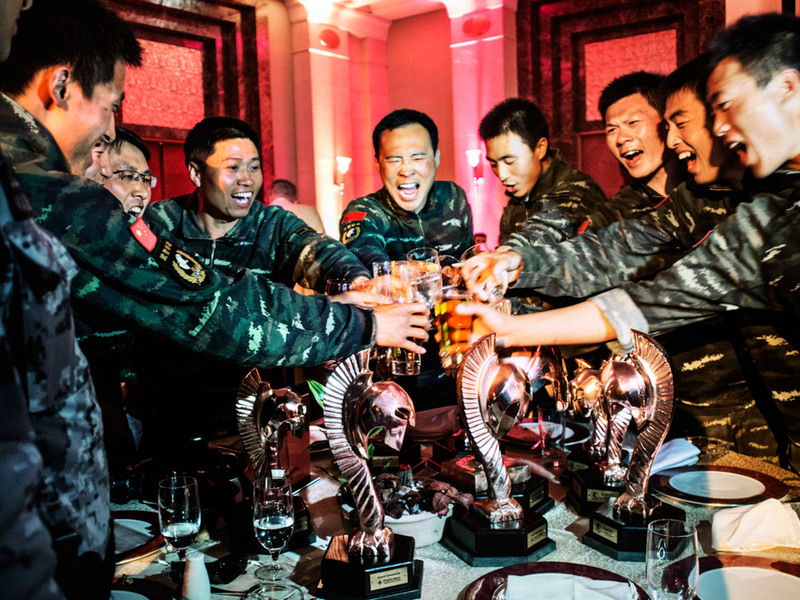 The Snow Leopard team from China celebrate their winning at their table. 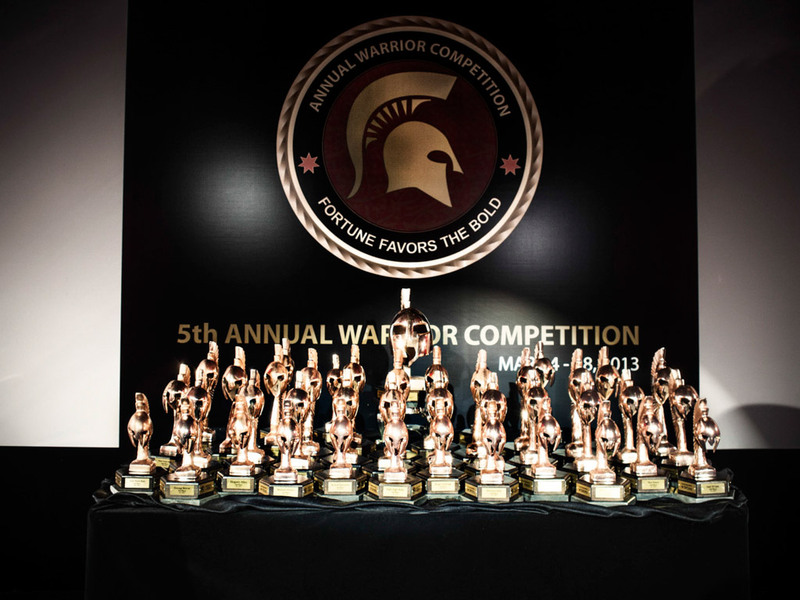 They won many events of the competition and become the champion team of the warrior competition 2013. 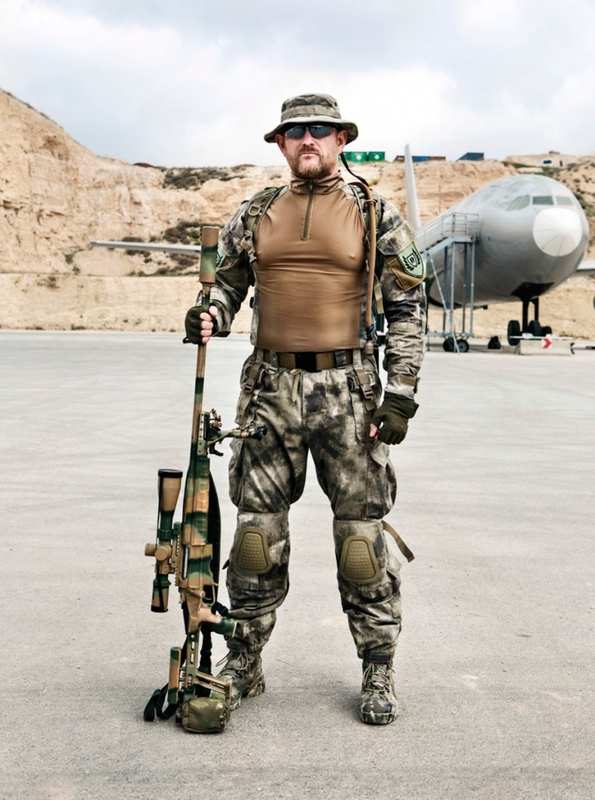 A member of Special Forces, Russia. 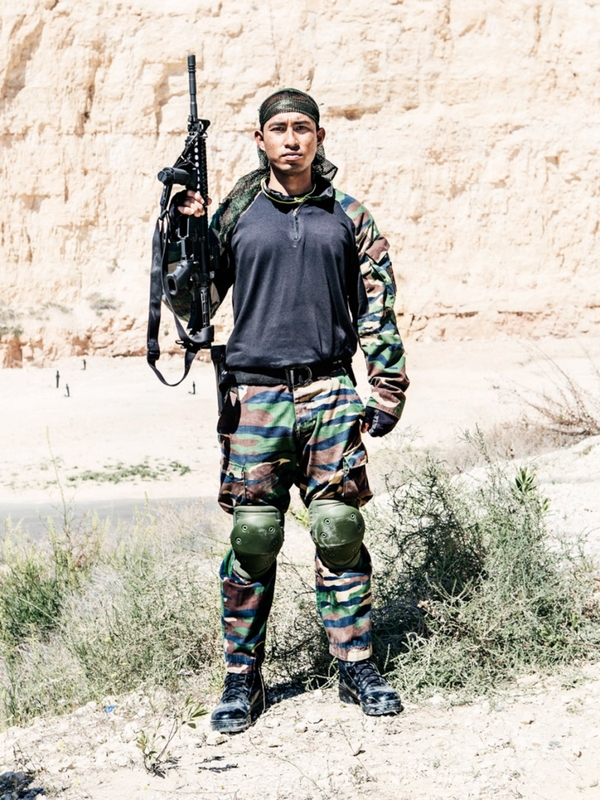 A member of Special Forces, Malaysia. A member of the Presidential Guards, Palestine. A member of Arcent Team, USA. 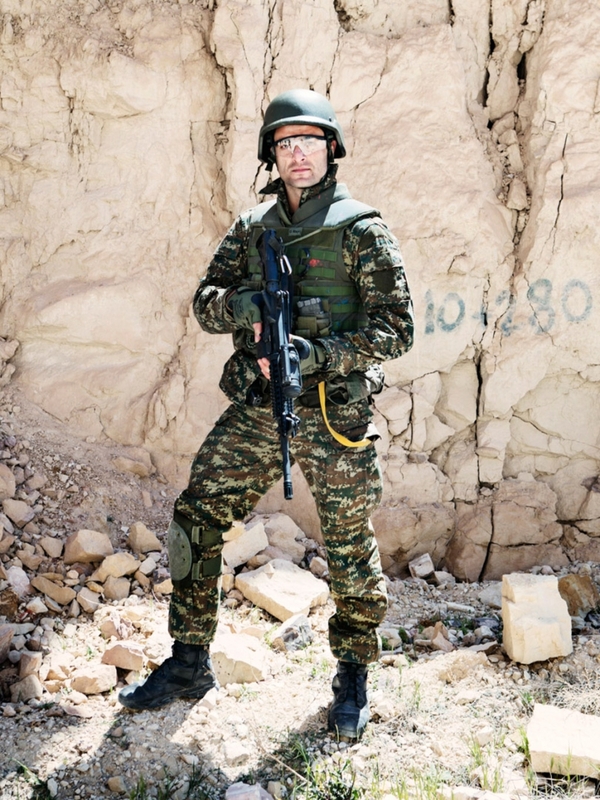 A member of Special Forces, Greece. 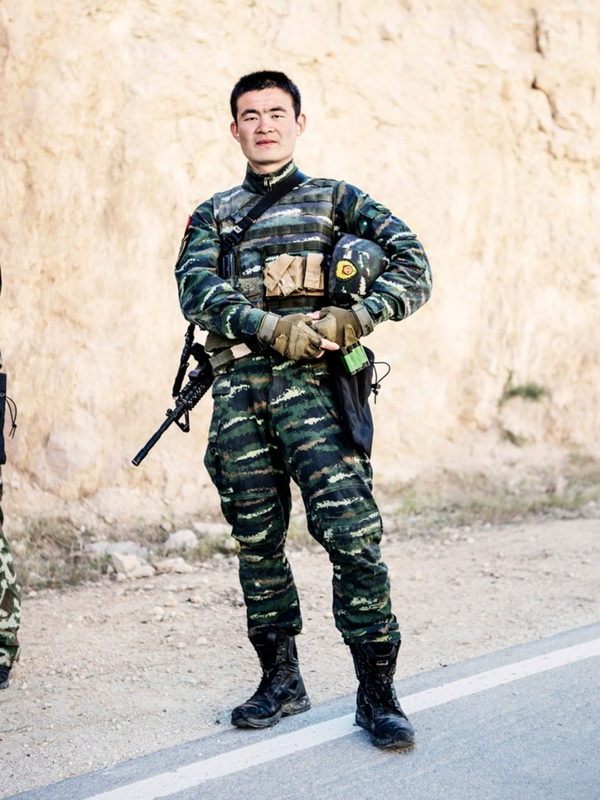 A member of the Special Operations Unit of the Chinese People's Armed Force, China. War strikes terror at the hearts of those who have been in a conflict and sends adrenalin pumping through others who desire to be in one. Since 9/11, the business growth of war has increased 5 times under the flag of global security. Everything is authorized now and the community of war has a theater where individual players can meet, study each other, sell arms, and show off strategies and the latest technologies of war. The war business will never know a “financial crisis.” Weapons contractors are reaping significant profits because of wars that are happening all around the world. The first part of my project is about those Warriors - not simple soldiers - who are considered the heroes of thenew millennium: the Special Forces. Center: The KASOTC. 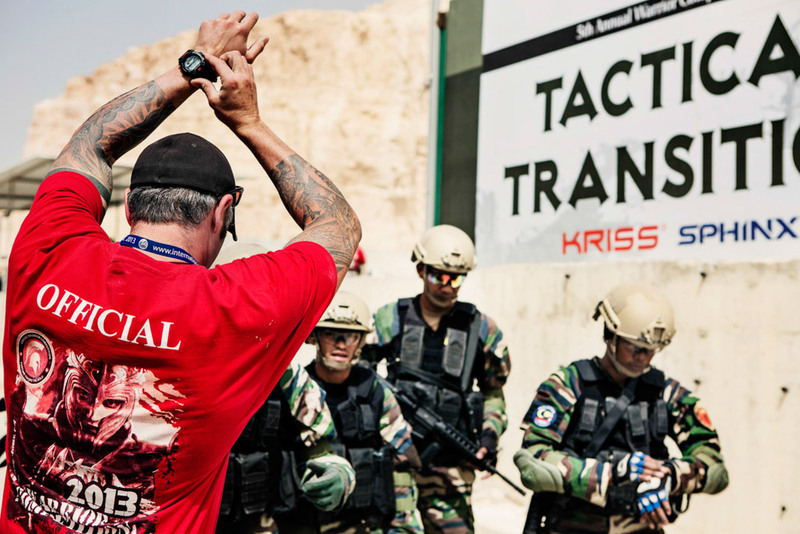 Here a unique combination of elite instructors (mostly retired US Special Operators), equipped with the tools of advanced technology, prepare Warriors for the challenge of armed conflict in the twenty-first century. 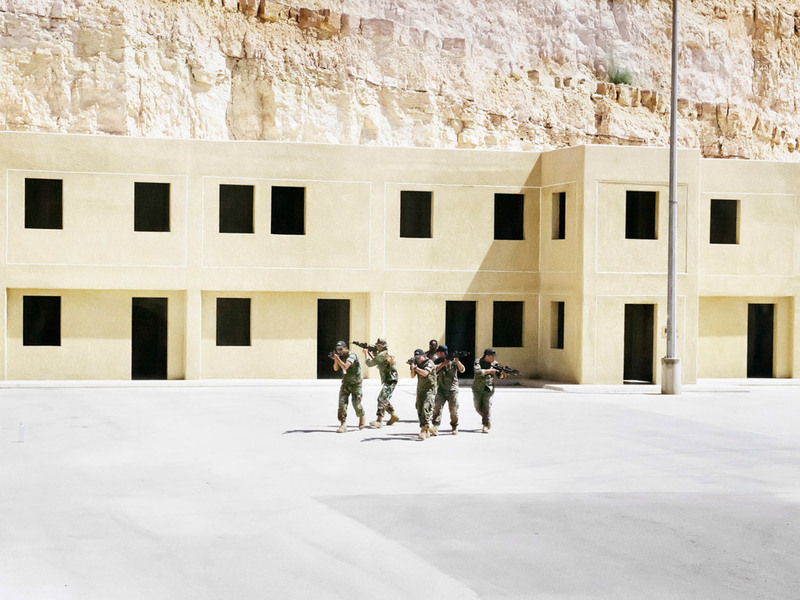 The KASOTC is a twenty-five-kilometer-square facility fully equipped with multiple distance ranges, including: moving target; four-story; close-quarters battle; live-fire structure; and the largest mockcity in existence, sixty-seven buildings, clustered together to resemble everything from an Afghan village to an embassy. The site is full of special battlefield effects, including the stench of dead bodies, as well as hundreds of cameras, microphones, target systems, and simulators. There’s even a full-scale Airbus 300 aircraft model and control tower with dummy passenger-targets on the plane who can stand up from their seats. One week of training here can cost up to $250,000. 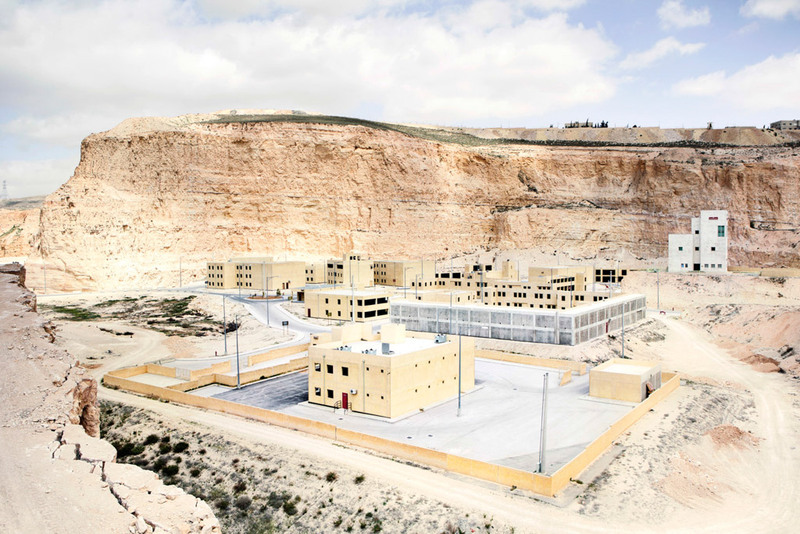 An annual “Warrior Competiton” is held here (organizers call it “the Olympics of counterterrorism”). It’s a perfect marketing tool to show off the latest facilities and tools of war, and to entice new customers (Warriors) from around the world. In the 2013 edition, thirty-five teams from around the world were invited to compete in the games, for free. 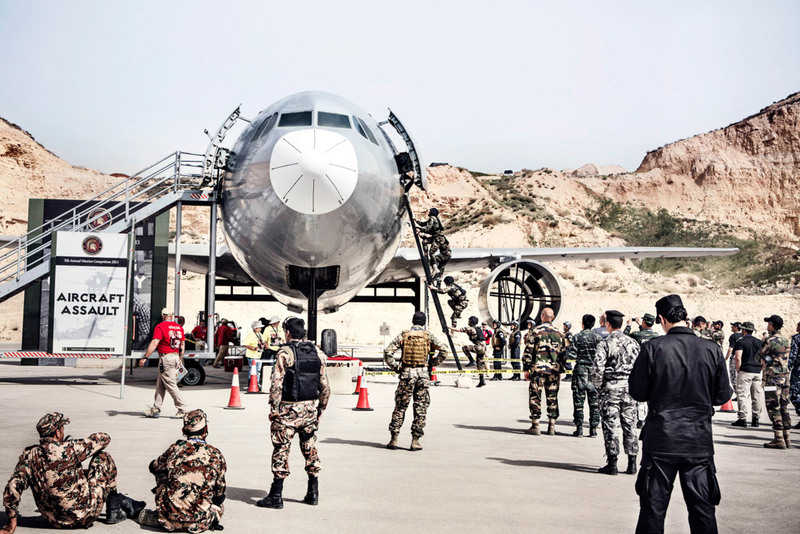 Competing against each other for a week, they demonstrated their prowess in several events: breaking into buildings; “neutralizing” opponents; rescuing hostages; staging an assault on an aircraft; shooting at targets over 1,000 meters away – all while being scored for speed and accuracy. Generals sitting in the spectator stands cheered for the success of their teams, while officials commented on the most daring plays as if they were covering a soccer match. 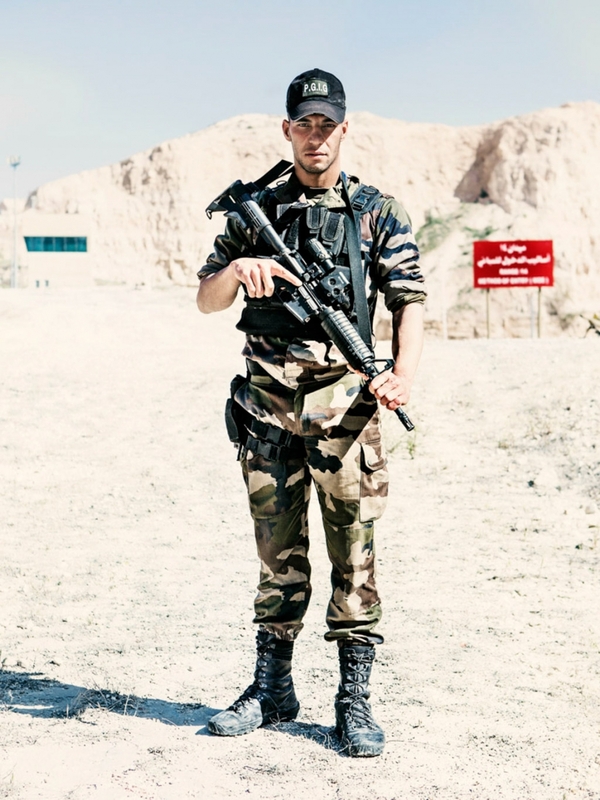 Off the field, US Marines and Palestinian Tigers used their hands to scoop up couscous from the same plate; Chinese and Austrian snipers compared rifles; storm troopers from Spain and Saudi Arabia exchanged daggers; French paratroopers offered water to their old enemies, the Algerians. The other half of the story around conflicts that I’d like to tell with my project is about the business of war. In fact there are many other stories I’ve found during my work where the “brotherhood” of this elite community can be shown through bewildering situations. For example, there are Weapons Fairs held around the world, where ministers, generals, and commanders gather together and confront each other, share new weapons, plan conferences and decide the next moves. Often the atmosphere is not much different than a car fair – pavilions from around the world display new products while beautiful girls welcome visitors; classical music plays in the canteen during the lunch break, while businessmen show off brand-new models of Bazooka guns and flying drones. Other chapters of my project include Wounded Warriors; the workers and industry of big companies that produce sophisticated weapons for Warriors; the geeks community that makes project simulators. Taken all together, I think, these chapters tell the story that that perhaps, in the end, War is nothing more than Big Business. 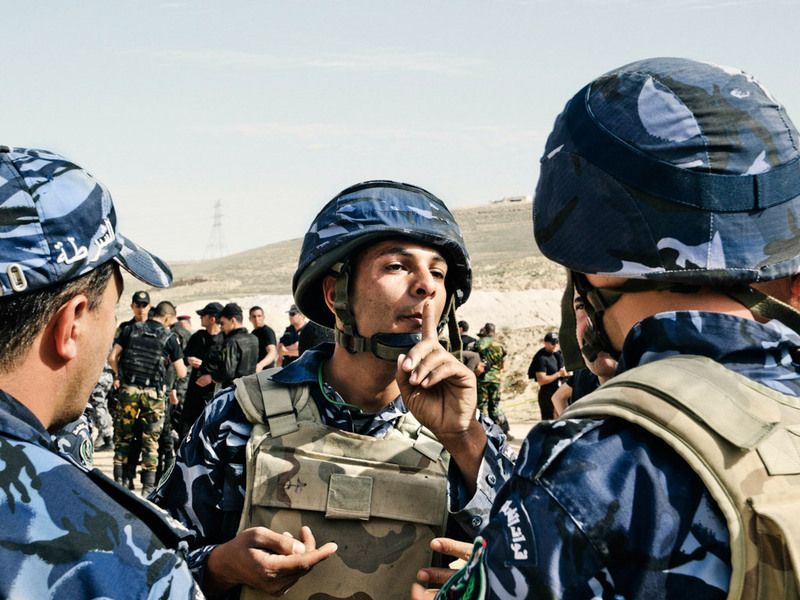 Luca Locatelli is a documentary photographer working in editorial and long-term projects, focusing on story telling. The Observer, The Guardian, The Sunday Times Spectrum, Geo France, National Geographics, Colors, L’Espresso, D di Repubblica, Le Monde2, Ad Russia, IL Intelligence Lyfestyle 24 ore, Courier International – Japan, Aften Posten, Riders Italian Magazine and others. Luca is positive about new media and he is actually involved in multimedia projects.